One month after acquiring uberVU, HootSuite is announcing its addition to the HootSuite App Directory, the first step in integrating uberVU analytics and HootSuite’s social relationship platform. The uberVU via HootSuite application brings keywords, brand mentions, and competitive monitoring from across the web into HootSuite’s robust social engagement solution for immediate action. As the world’s most widely used social relationship platform, HootSuite has offered power users and global enterprises industry leading social media management and content analytics. Now, HootSuite dashboards can be equipped with uberVU’s powerful social insights, empowering customers to turn data from millions of blogs, forums and social networks into actionable engagement opportunities. To truly achieve social media intelligence, organizations require advanced data in the hands of entire departments, not just analysts. 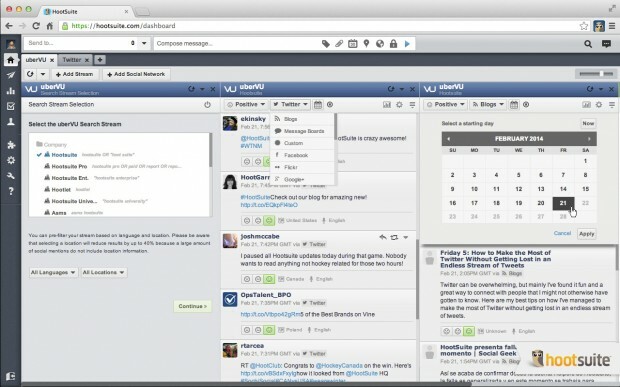 The uberVU via HootSuite app brings an actionable stream of real-time conversations from across the web to the dashboard of every social media user in your organization. Team members can quickly filter these streams of data by language, location, or sentiment so that you never miss a critical opportunity to amplify a positive social media story or engage with a concerned customer. Bring real-time, actionable insights to the HootSuite dash and manage social data from across the web to ensure no mention of your brand or competition is ever missed. Filter uberVU via HootSuite app stream results by location, language, source, and sentiment to drill into specific conversations to find positive messages to amplify and negative messages to triage. Amplify mentions to social media networks including: Google+, Facebook, LinkedIn, Twitter and more. During major events like the Olympics, the uberVU via HootSuite app can be used by marketers and sales teams to track a wide range of impact from advertising and marketing campaigns. You can see the power of uberVU’s analytics in action by checking out who won the #SochiSocial Games. The combination of data and engagement in the app empowers teams to keep a pulse on campaigns and engage immediately on developments happening in the moment. Since acquiring uberVU, we’ve been making good progress on our goal to bring powerful analytics to the world’s most popular social relationship platform. 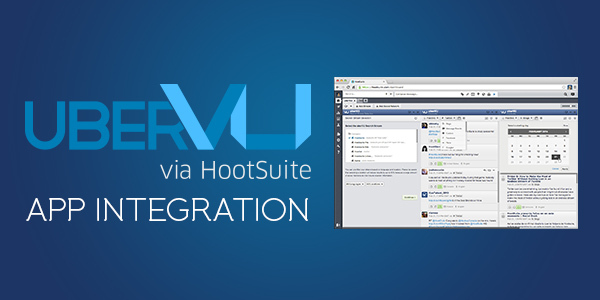 The uberVU via HootSuite App marks the first exciting step in combining our platforms. 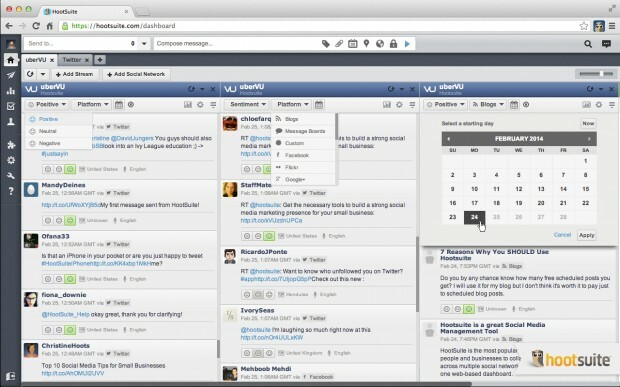 The application is available for HootSuite Enterprise and Pro Customers. Learn more about uberVU via HootSuite. Filter uberVU via HootSuite streams by sentiment, location, language, source, date, and platform, all in one unified interface.